Walton County was required to maintain a County Surveyor as part of the terms of Statehood. ﻿The content of the survey shown above is not relevant to our case. The fact that this survey was signed by a Walton County Surveyor is very relevant. The survey was created by Mr. Geo. H. Hollowell in 1889, and was found on the Walton County Clerk of Courts public records at Plat book 1 Page 32. The TRS grid for 1 South 19 West was originally surveyed with a 6 degree 10 minute angle. The angle would appear as shown, with the southeast corner of the grid tilted further south than the west end of the grid. Below the angle is identified as "Variation 6 deg 10 (min) East"
The angle surveyed by the Walton County surveyors is completely opposite of the work done by the Government Land office in 1826-27, and is shown on the above right grid with the west end of the grid tilted further south than the east end of the grid. The discrepancies between the 2 opposing angles are not very noticeable at the east end of both grids shown above, but the differences become significant in the center area of the grid(s) by about 400 feet, and become tremendous differences at the east end(s). The differences in the angles on both examples shown above have resulted in years of boundary disputes and litigation in the Walton County courts. Local Judges have ruled on corners "set" or established by the County Surveyors, rather than identifying and confirming original corners set by the Federal Government. Light wood stakes originally set by the GLO are "discounted" as possible corner locations, as they are located so far away from field work done and corners set by County Surveyors to even be considered. Survey crews with the Florida Department of Transportation have also contributed to the confusion by refusing to investigate noted discrepancies, or to confirm true corner locations while in the field. S.K. 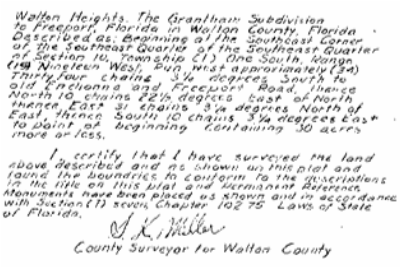 Miller is identified as the “County Surveyor for Walton County” and the creator of this survey.Miller notes that he “placed” or set all of the reference monuments used in his survey including the POB or [Point Of Beginning], yet he does not indicate that there was any existing monumentation at the POB or in the vicinity. Mr. Miller does not indicate how he attempted to tie into the TRS Grid before setting the POB. There is no reference to finding any type of pre existing Federal TRS monumentation near the section corner location he ultimately set to start from. The Federal TRS survey identifies 6 degree 10 minute East bearing with the Township Grid. S.K. Miller ran his line the wrong direction when compared to the Federal TRS field notes. You can not change one part of the TRS Grid without changing the rest of it. Each corner set by a County Surveyor creates a ripple effect to other section corners as they are all connected within the grid. There is also the question of authority. A County Surveyor must follow the Federal survey and not change it in any way. There is no accuracy or compliance in placing a corner monument where a surveyor “thinks” it should be, or where it is “convenient” without finding pre existing Federal monumentation or witness trees and noting such evidence on the survey that is being created. A section corner must be “proven” in accordance with the instructions from the Office of the U.S. Surveyor General so that it does not interfere with the TRS Grid. There are no longer public records available in Walton County from the County Surveyors office, no field notes or files to review and compare against the Federal TRS field notes and files. The few surveys created by County Surveyors that are found in the Plat Books of the public records are the only evidence that the office existed at one time. 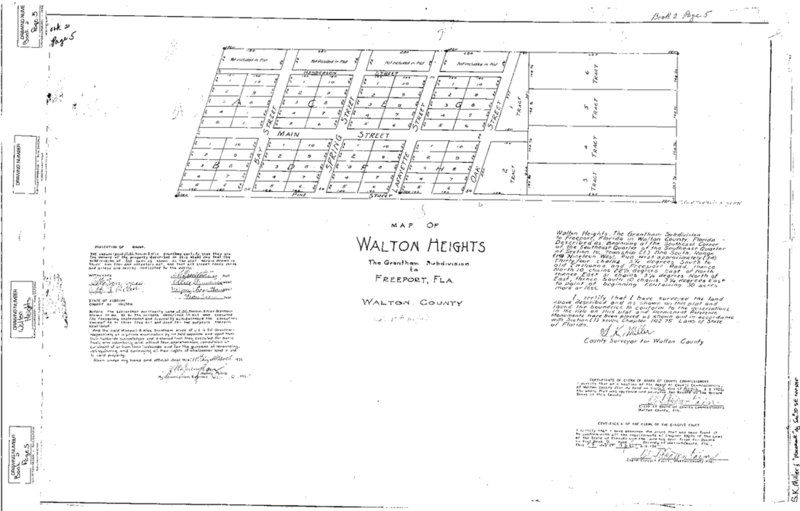 The document shown above is a response to the request for documents from the Walton County Surveyors files. The public records of this office cannot be found, as stated in this letter from the Walton County Commission Office of the County Attorney 02/18/2010. Functions of the County Surveyor The Indiana Constitution officially established the County Surveyor as an elected office. Like many county officials, the County Surveyor is elected to a four year term. Due to the technical nature of the position and the expertise required, the surveyor has no term limits. The obligations of an elected County Surveyor are addressed in Indiana Code: Title 36, Article 2, Chapter 12, Sections 1 to 15. Various Indiana Codes and Indiana Administrative Codes govern how a County Surveyor performs these obligations. The County Surveyor is also guided by Federal requirements (such as the Clean Water Act and the Endangered Species Act) which are administered by agencies such as the US EPA, US Army Corps of Engineers and the US Fish and Wildlife Service. 1. Stormwater Management - Water Quantity The County Surveyor is a county’s technical authority on drainage. Every county has a Drainage Board, and every County Surveyor is an ex-officio member of the Board. This means the Surveyor manages the construction, reconstruction, vacation/removal and maintenance of all regulated drains and proposed regulated drains. Indiana soils are not inherently conducive to farming. The soils are clay and the water tends to sit rather than drain making for a swampy environment. In the 1800’s, Indiana farmers started to get together and create community drains which everyone paid to maintain. Today, Indiana county surveyors are responsible to ensure that these regulated drains function. This is of the utmost importance to the entire community to prevent flooding. The Surveyor is responsible for the field investigations of drains, and develops drainage studies and technical specifications for work performed on tile drains and open ditches. They are responsible for reconstruction petitions, new drain construction, and Public Hearings concerning maintenance funds. They often supervise the investments of the assessments collected to support or maintain the Regulated Drain Infrastructure. Your County Surveyor works hard to try and protect citizens from flooding and drainage problems. 2. Site Development When development occurs in your county or community, the County Surveyor often works hand in hand with other community officials to ensure the existing residents are not negatively impacted. Their efforts help protect the neighbors upstream and downstream from pollution and flooding while the work is underway and after it is completed. The Surveyor deals not only with developers, but also with the people developers hire. These could be architects, attorneys, design professionals, engineers, environmental consultants, planners, project managers, surveyors and their technicians. Whenever development occurs, be it a single family home on rural acreage, an entire subdivision, a strip mall, or an industrial park, the County Surveyor is there to help guide the process and review the plans. A review of the information contained within the County Surveyor’s Office (maps, surveys, topos, aerials or even the technical requirements for the submission of the plat) can be very instrumental in a smooth transition from planning through construction to completion. 3. Section Corner Perpetuation Every deed, parcel, and legal land document in the State of Indiana is tied into the original survey performed in the early years of settlement. Section corner stones were set to mark each square mile of the State. In order to prevent gaps and overlaps of land ownership it is of the upmost importance that these markers are maintained. The County Surveyor is tasked with the job of finding section corner stones, (by digging in roadways, yards and fields) referencing them by measurements to nearby structures, (such as utility poles, fence posts and buildings) and marking the location of the section corner at the surface (of the ground, roadways, etc.). In each county there is a Section Corner Perpetuation Fund that consists of money collected by the County Recorder when deeds are recorded. The County Surveyor must maintain a corner record book showing original government section corners, and is required to establish, locate, and reference at least 5% of the corners each year. 4. Geographic Information Systems (GIS) Counties have led the way in the State of Indiana to produce geographic information systems and County Surveyors are at the forefront of the GIS process in their counties. They have often been the “champions” of the efforts to start a GIS. They may be the GIS Mapping Coordinator, the Chair of the Policy Committee, or even house the entire GIS within the County Surveyor’s Office. And why not? GIS is a computer based smart map that can be queried. What office in County government has the maps? The County Surveyors Office! GIS may be used for many things by the citizens of a county. These maps include property lines, streets, aerial photography, county regulated drains and their watersheds. They sometimes include voter precinct maps, flood zone maps, or school district maps. These maps may provide computer generated school bus routes to reduce time, save money, and increase safety. 5. Stormwater Management - Water Quality For most counties, the County Surveyor is either responsible for, or is involved in, seeing that we keep our waters clean.One way they achieve that goal is by interpreting and implementing Stormwater requirements mandated by the Environmental Protection Agency under the federal Clean Water Act’s National Pollutant Discharge Elimination System (NPDES) permitting program. In Indiana, these programs, administered by the Indiana Department of Environmental Management (IDEM), require Indiana Counties to follow specific guidelines for managing stormwater discharges from government (Rule 13) and construction (Rule 5) activities.As a component of these requirements,’s across Indiana have developed detailed Storm Water Management Ordinances and Technical Standards in their counties. Every day, surveyors are managing the water quality impacts of urban stormwater and are ensuring that their communities are in compliance with these federal programs. By doing so, they are preventing pollution while avoiding hefty fines. Additionally, the County Surveyor often sets minimum standards for filter strips which prevent valuable topsoil from running off into our rivers and streams. They are also responsible for ensuring proper construction on regulated drains including grading, drainage structures, and erosion control practices. Keeping our waters clean is one of the main concerns and/or responsibilities of the County Surveyor. 6. Did You Know? Your County Surveyor is a member and technical advisor to your County Plan Commission. They also advise various technical committees reviewing subdivisions, drainage plans, and development plans. They may also be a member of one of the various River Basin Commissions or Regional Planning Authorities established by the State. In each instance, the surveyor is there to serve as the citizens’ advocate protecting their property and well being. The Indiana Alcoholic Beverage Commission requires a state form to be signed by the Surveyor to verify the Business Location for ABC permits. The Surveyor’s office maintains information such as bench marks, USGS Topo Maps, Wetland Inventory Maps, Flood Zone Maps, Surveyors Records, aerials, and drain files. The County Surveyor keeps annexation and dis-annexation descriptions for each city and town on file. The Surveyor maintains a Legal Survey Record Book for all “legal surveys” within the county. These surveys, prepared by a licensed surveyor resolve property disputes. Summing it Up On any given day, your County Surveyor and their staff may be in the field working on section corner perpetuation or on a county regulated drain. They may be in the office discussing the next big development coming to your county, or having a public hearing for a drainage board concern. They may be helping a constituent understand a land surveying description, or explaining technical specifications to a contractor on a construction project. They may be certifying an alcoholic beverage permit, or meeting with state and federal agencies concerning permit conditions for a regulated drain project. The duties of your County Surveyor are many, but a large focus of what they do is meant to reduce flooding, while maintaining clean water in our lakes, ponds, regulated drains, rivers, streams and wetlands. Your Indiana County Surveyor is there to help properly manage and coordinate the growth of our Indiana communities, while at all times being a good steward of our natural resources and tax dollars. If you have any questions, please visit your County Surveyor’s office. Their technical assistance and guidance are an extremely valuable asset. Find out what your Indiana County Surveyor can do for you!